know it’s a bit silly, but the first thing I picked up when I finally got a library card, was a couple of the Tinker Bell comic books from Disney. I grabbed four of these comics from the library; Tinker Bell and the Flying Monster, Tinker Bell and Blaze, Tinker Bell and the Lost Treasure, and Tinker Bell and the Pirate Fairy. They were all a lot of fun, definitely children’s comics, and just a genuinely good read. Tinker Bell and Blaze and Tinker Bell and the Flying Monster are both compilation pieces. These books consist of several stories, each just a couple pages. They’re fun, additional stories that show us a little bit about what’s going on in Pixie Hollow with our favorite fairies in between the movies. 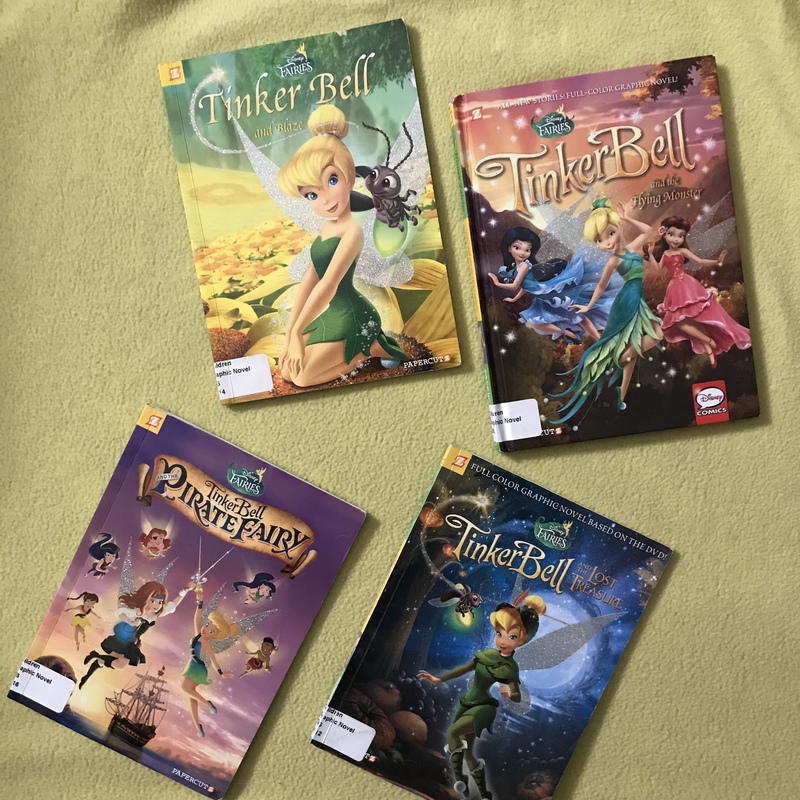 The other two books, Tinker Bell and the Pirate Fairy and Tinker Bell and the Lost Treasure, are graphic novel renditions of the movies by the same names. These follow the same story as the movies, and I think they’re a great addition. I feel like these two books would be a great way to get a young child into reading; they already know the story, so it shouldn’t be too difficult to understand and learn from. I really enjoyed reading these. It was simply fun and easy, and made for a really relaxing day. Taking a break from reading adult fiction to read these made my day better. I think if you’re a big fan of Tinker Bell, or a relative of a younger fan, these would be well worth checking out. What have you picked up from the library recently?